Reminding you that everything you need is everything you got! Alena Conley, Wife, Mom of three and full time Entrepreneur brings you into her world as a woman committed to being the best version of herself by not forgetting HERSELF and inspiring others to do the same. 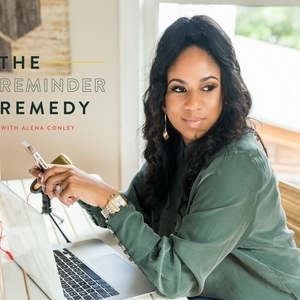 On the most recent episode of The Reminder Remedy with Alena Conley she shares a bonus episode before she kicks off the second half of season two. It's a full life update on what's been going on with your favorite podcast host! On this episode of The Reminder Reminder Remedy with Alena Conley she kicks off women's month with Lauren Grant. Lauren curates memorable experiences for her clients, ranging from professional conferences and galas to sponsorship activations. With high profile clientele and sponsorships including the National Association of Investment Companies, REVOLT TV, Fox, Google, and Pepsi, The Grant Access’ impressive and highly satisfied portfolio of clients are a testament to Lauren’s commitment to cultivating a memorable, five-star experience. Lauren’s exemplary service acumen comes from a 10 year career in media and advertising. Her positive attitude and dynamic energy help to put clients at ease and ensure smooth planning and flawless day-of execution. Her collaborative approach has allowed her to build a vast network of vendors with whom she’s able to negotiate in order to maximize value for clientele at all budget levels. She is attentive to the needs of her clientele, taking a hands-on approach in understanding and ultimately executing their vision. The Grant Access, founded in 2014 is the manifestation of over 13 years of event planning experience. Lauren is also the co-founder of HBCU SPRINGCOMING, AN ANNUAL FESTIVAL HELD IN NEW YORK CITY. INITIALLY DESIGNED AS A HOMECOMING IN THE SPRING, IT IS AN OPPORTUNITY FOR ALL COLLEGE GRADUATES TO REUNITE AND SOCIALLY ENGAGE WITH ONE ANOTHER THROUGH A WEEKEND OF EVENTS. IN ITS THREE YEARS, SPRINGCOMING HAS REACHED NEARLY 10,000 PEOPLE. This year's HBCU SPRINCOMING is NYC APRIL 18-21, 2019. 015: "The Breakout Year with Melissa Butler"
in the latest episode of The Reminder Remedy with Alena Conley her gal pal and boss babe Melissa Butler joins her to discuss all things Lip Bar, life, black folks and more. Melissa's baby The Lip Bar turns 7 in a few days and Melissa shares why 2018 was their "breakout year". Tune in now to get your exclusive promo code on all products! I kicked off my newest series “My Circle” to share some of the stories of my bomb a** friends! I hope to inspire listeners to remember that your network is your net worth and that relationships are a two-way partnership. Be a fly on the wall in some of my most intimate convos. This episode I’m chatting with one of my closest friends Melissa Butler, Founder & CEO of The Lip Bar. In the most recent episode of The Reminder Remedy, Alena chats with her Hypnobabies coach Stephanie Banguilan. Alena shared in episode 012 during her birthing story how Hypnobabies was a game changer for having an unmedicated vaginal delivery. Learn all about this fascinating birthing tool on this episode. In the latest episode of The Reminder Remedy Alena chats with her doula Tomecas of Omorose Blessings. Are family planning or expecting and wonder if you should hire a doula? Or maybe you've heard the term mentioned by still are unclear on what it actually means? Get all your questions answered in this episode. During the latest episode of The Reminder Remedy with Alena Conley she shares her healing birth story. After two previous cesareans, Alena was unsure if she should even attempt a natural vaginal childbirth. Everything you read says it’s not possible right? Well with the supportive midwives and OBs at See Baby Midwifery in Atlanta, she was reassured that she could in fact have the birth she dreamed of. Alena decided to take a Hypnobabies course to help prepare her for their birth, tune in for all the details! In this latest episode of The Reminder Remedy Alena shares the role conferences, retreats and masterminds have played in her personal and professional growth. She explores how to find the perfect event for you, discusses how much you should invest and how to make the most of your experiences. Special guest and former PR Exec turned Lifestyle Mogul Arian Simone joins Alena in sharing her own journey and how these types of events played a role in her life. Arian also tells more about how her journey ultimately led to launching the Fearless Conference experiences for women to attend around the world. You can learn more about Arian Simone at www.ariansimone.com and www.fearlessmag.com, or on IG @ariansimone. Alena shares her most recent attempt at UnMastering Motherhood after finding out that she is expecting Baby Conley #3. Four years ago Alena and her husband Prince shared a video on YouTube called "Plans Never Go as Planned". Alena uncovers how even four years later this mantra is helping her keep her sanity as she prepares for this next phase of life. During this 2-Part Episode Alena Conley continues her My Circle Series with Chasity Logan and Tiffany Williams as they explore what Alena considers to be one of our most untapped powers when digging into our "secrets to success" arsenal. These episodes are sure to REMIND you of one our greatest gifts. 006: What is The Reminder Remedy? Alena celebrates 1000+ listens with a self-titled episode debuting her "self-care" methodology The Reminder Remedy that has bee so powerful in her life and she hopes will be a game-changer for all who apply it! Alena rolls up her sleeves and digs deep as she addresses one of her most frequently asked questions. "How do I get UnStuck?". Beyond motivation, inspiration and affirmations, Alena uncovers what the actual brain requires for us to work from a space of true mental abundance. After having two extreme moments of "stuckassness" Alena wanted to understand why she can have amazing months and then feel like she's back a square one. In this episode she shares how she's creating permanent change for herself and how you can too! During this series Alena encourages listeners to not only network laterally but to build with peers. Knowing that your network is your net worth this series explores how to grow your network while valuing your existing one. In this episode Alena interviews one of her best friends, Chloe Williams. Chloe is Director of Communications and Public Relations, REVOLT Media & TV and lives with her fiancé Jose Duverge in Harlem.